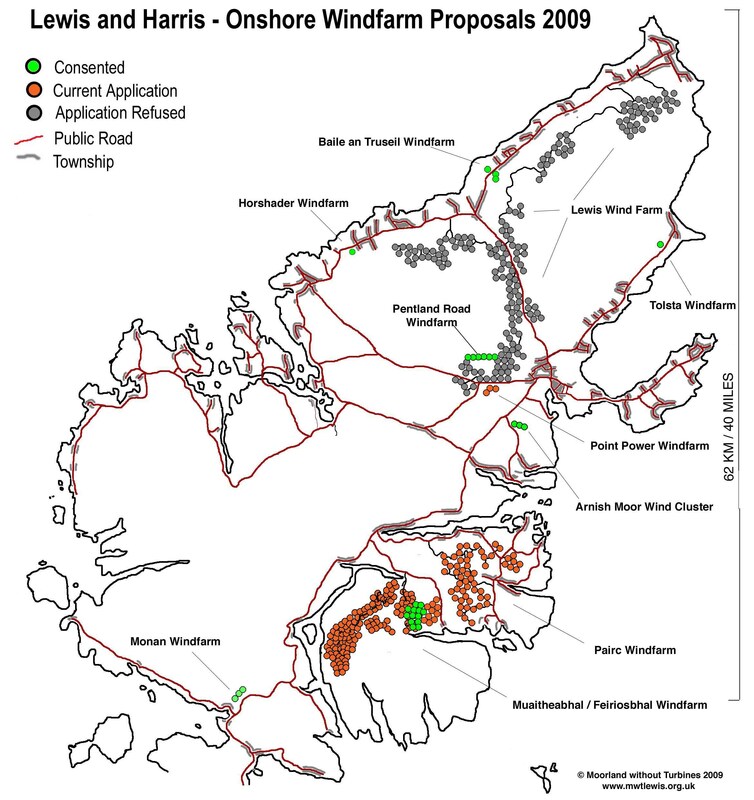 The maps have now been update to show the new Stornoway Windfarm proposal (2011). Ian Funnell, Director of Transmission Projects, SSE, Inveralmond House, 200 Dunkeld Road, Perth. 14 January 2010 The Scottish Government has announced that it has given planing consent for 33 turbines to be built on the Eishken Estate. These are the turbines that were proposed in the last application by Beinn Mor and Crionaig Power in August. SSE have announced that they will be conforming to the request by CNES to lay a sub-sea cable between Gravir and Arnish to service large windfarms in north Lewis. Associated applications which are at various stages in the planning process include: Converter Station at Gravir (undergoing consented by CNES), pavement to avoid works traffic in Gravir (consented), overhead transmission lines between Gravir and Stornoway (scoping). Documentation released with the Beauly Denny line consent listed Pairc Windfarm as a 'suspended' project, while media reports have suggested that SSE may be concentrating their efforts on off-shore projects. Scottish and Southern Energy submitted an ammended application to build a 26 turbine (94 MW) windfarm on Pairc Estate in Feb 2009. 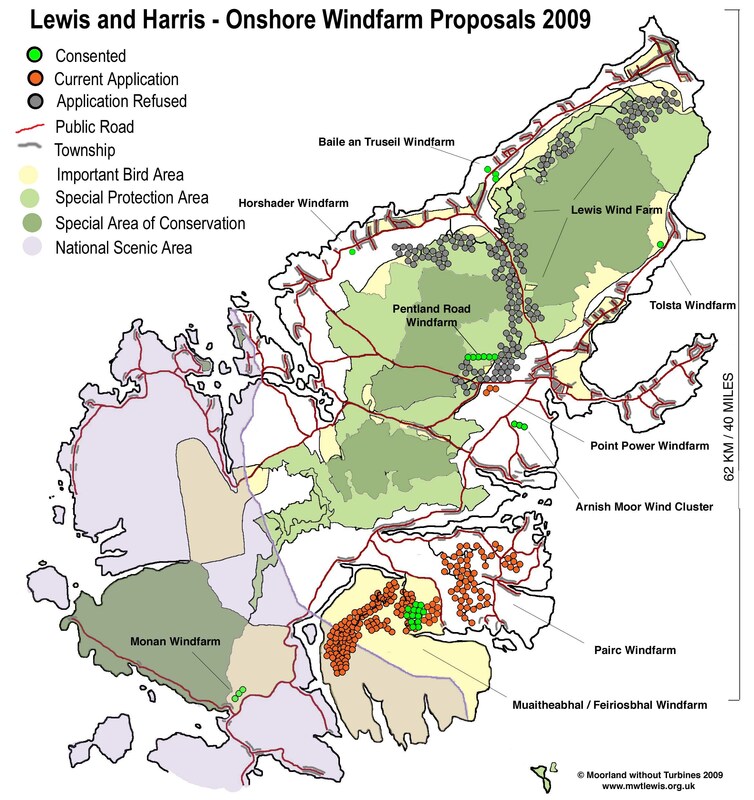 This application was recommended for approval by the Comhairle nan Eilean Siar planning committee on 21 April 2009. 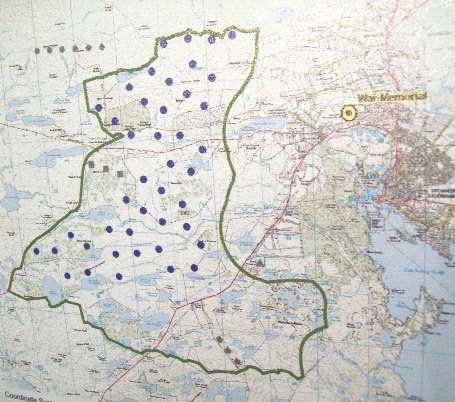 A previous application by SSE PLC to build a 205MW windfarm on Pairc Estate, Isle of Lewis, was put before Comhairle nan Eilean Siar in 2007. It was decided to recommend that the Scottish Ministers approve only 26 of turbines.